"Arab Quarter" redirects here. For the Muslingauze album, see Arab Quarter (album). The Muslim Quarter (Arabic: حَـارَة الـمُـسْـلِـمِـيْـن‎ Ḥāraṫ al-Muslimīn; Hebrew: הרובע המוסלמי Ha-Rovah ha-Muslemi) is one of the four quarters of the ancient, walled Old City of Jerusalem. It covers 31 hectares (77 acres) of the northeastern sector of the Old City. 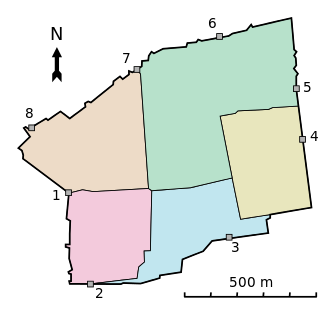 The quarter is the largest and most populous and extends from the Lions' Gate in the east, along the northern wall of the Temple Mount in the south, to the Damascus Gate—Western Wall route in the west. The Via Dolorosa starts in the quarter. 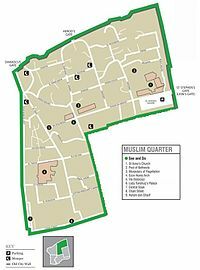 The population of the Muslim Quarter is 22,000. The Muslim quarter had a mixed population of Jews, Muslims and Christians until the 1929 Palestine riots. Some 60 Jewish families now live in the Muslim Quarter. Yeshivat Ateret Yerushalayim is the largest yeshiva. In 2007, the Israeli government started funding the construction of The Flowers Gate development plan, the first Jewish settlement inside the Muslim Quarter since 1967. It would include 20 apartments and a synagogue. Jewish landmarks include the Kotel Katan or Little Western Wall, and the Western Wall Tunnels, which run below the neighborhood along the Western Wall. There are many Roman and Crusader remains in the quarter. The first seven Stations of the Cross on Via Dolorosa (Way of the Cross) are located there.